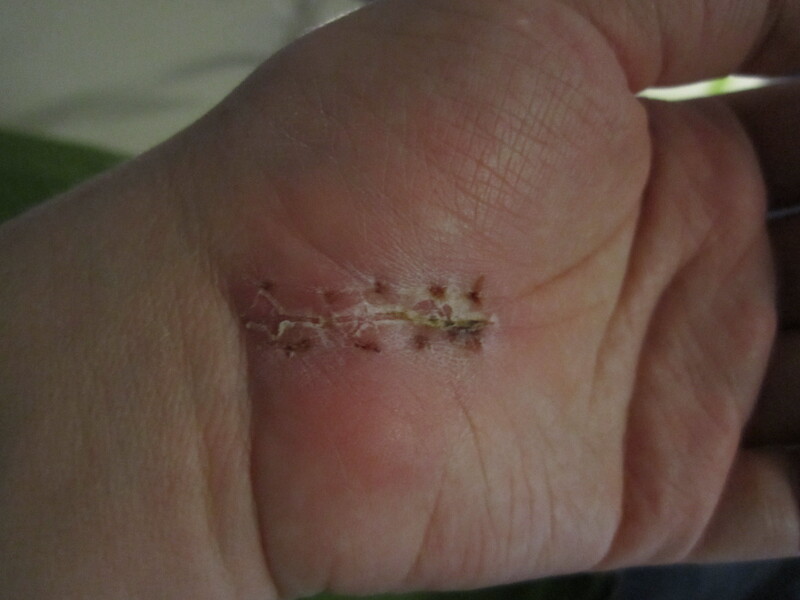 My sutures from the carpal tunnel release were removed this morning. Look how much better things are today! Sorry about the ugly photo. I anticipate this will be the last time I share my scabs with the internet. You’re welcome. Unfortunately, the surgeons who do this little procedure always stitch up the wounds the same way. According to my family doctor, who practically needed a garden spade to dig the nylon out of my palm this morning, it’s an especially ugly type of suture to remove. As the person whose hand she needed to gouge again and again to get all the stitches out, I agree. Last time we did this song and dance was just as icky. Two weeks is a heck of a long time to “wear” extra-snug sutures, especially ones in an extremity that is always moving. I’m so glad the fancy sewing is gone, since the knots at either end tore my skin a little bit whenever I moved the wrong way. To be fair, the sutures tore only when I was doing ridiculously ambitious things so soon after surgery, like cracking an egg, applying deodorant, or trying to push the button on the remote for my garage door opener. There was one day that drawing on my eyeliner nearly sent me through the freshly painted ceiling of my bathroom, which oddly enough, I didn’t tear at my stitches painting. Smoky black eyeliner is supposed to make me feel dangerous, not nearly kill me. The most important thing I learned today is that removing sutures leaves a series of tiny holes (technically at least a dozen wee open wounds) across the body part from whence they came. That knowledge is particularly important to bear in mind during simple everyday activities, such as slicing and eating a fresh orange. It was a new kind of sting, I tell you. Next Post Summer in January? Oh, wow. The last sentences definitely made me wince. I’m glad that you are well on your way to recovery now. Thanks, Mrs. Firepants. A few more weeks and I can swim, which should help a bit with the wrist flexibility.